One thing to mention - I will not be building the guitar from scratch. For this I have no knowledge, no skills, no tools, no time... and the list goes on. What I'm planning to do is to buy a used instrument that fits my idea and then heavily modify it. The extent of the modifications will depend of the base guitar of course, but I'm planning at least to refinish the body top and headstock and modify (presumably replace) the fingerboard. Plus do a number of CERN-themed hardware and electronics modifications. We'll see. 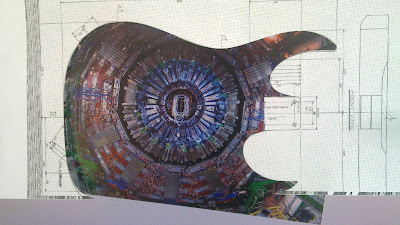 The picture is a photo of the CMS detector taken by Michael Hoch, and featured - among other places - in the CMS Photo Book. How exactly the image will end up on the guitar body... I'm planning something fun for that. Not sure if it will work, but its worth a try. More next week, when I should get the pieces.